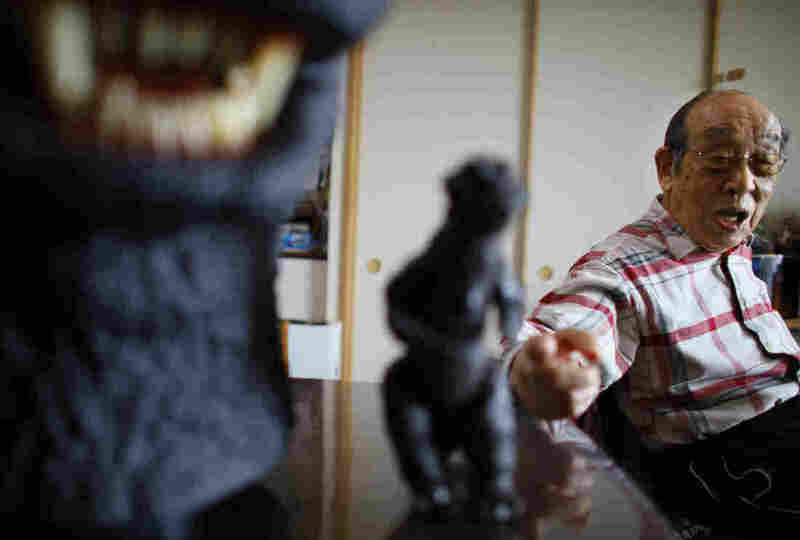 Haruo Nakajima, The Original Godzilla Actor, Dies : The Two-Way Nakajima played the iconic giant reptile in a dozen films, donning the suit that he says weighed about 220 pounds and wreaking havoc on model cities and rival monsters. He was 88. Original Godzilla actor Haruo Nakajima points a figure of the monster he made for the movie during a 2014 interview at his home in Sagamihara, near Tokyo. Haruo Nakajima, the Japanese actor who was the first person to put on the Godzilla suit and bring the iconic monster to life, has died. He was 88. Nakajima died Monday of pneumonia, his daughter and the Japanese movie studio Toho confirmed to multiple news outlets. Nakajima played Godzilla in the 1954 original and 11 subsequent films, donning the suit that he said weighed about 220 pounds and wreaking havoc on model cities and rival monsters. But he began his career in samurai films, including a small role in Akira Kurosawa's legendary 1954 film Seven Samurai. "I had the samurai top-knot hairstyle, holding a sword, and I often played the guy who gets killed," Nakajima said in an interview earlier this year with the Great Big Story. Nakajima recounted that he got the attention of Godzilla director Ishiro Honda on the set of a WWII film. "There was a scene where an airplane was on fire and an actor had to jump out of it. That was my role," he said. "Mr. Honda saw this scene and thought, 'This guy is full of energy.' They came to see me as someone who had guts, and I think that's why they wanted me for the role of Godzilla." In a 2004 interview with NPR, Nakajima described studying large animals at a zoo to help him prepare for the role of the lumbering reptile. "I watched the feet of an elephant and also a bear to see how a monster would move," he said. "Since materials were so rare, things like rubber were not available. Instead, they used ready-mixed concrete, so it weighed about 100kg. It was so heavy and hot, and with the lighting, it was even hot just to touch it. I was sweating all over my face, but I did the best I could." In the original 1954 film, Godzilla emerges from the ocean depths following a hydrogen bomb test and goes on a rampage through Tokyo. The movie was released just nine years after the U.S. dropped atomic bombs on Japan. As Columbia University's Greg Pflugfelder told NPR in 2004, "It's very clearly embedded, a message that if they, America, and more broadly we, the free world, continue down this path of destruction in developing nuclear weaponry, who knows what the result might be?" In 1962, Nakajima's Godzilla battled King Kong in King Kong vs Godzilla. But he later played the role of Kong in 1967's King Kong Escapes. And while Nakajima played some of the most recognizable roles in Japanese cinema, he told NPR that he has remained relatively anonymous. "There is no impact on people when I walk the street," Nakajima said. "I do not consider myself as a star. I thought it was going to be just one or two films." He acted in some 50 films, ending in 1973. According to The New York Times, Nakajima "is reported to have briefly taken a job at the bowling alley on the Toho studio lot," and later made regular appearances at comic and movie conventions. The Godzilla franchise is still going strong, the Times reports, and "the next in the franchise will star Ken Watanabe and is scheduled for release in 2019." Special effects have largely replaced actors in monster suits, and the films' original monsters certainly don't appear lifelike. But author Steve Ryfle, who wrote a book about Godzilla and its sequels, told NPR in 2004 that appearing real wasn't really the point. "I think the purpose was to make something that looked spectacular," Ryfle said, "and if you approach it from that standpoint, I think they're very entertaining."